The major in Communication offers hands-on experience in online and print journalism, radio, television, social media, political campaign coverage, and more. You will develop and start to hone real-world skills while: editing video footage in a personal suite; scouring the campus for breaking news; collecting data with a professional pollster as part of our nationally-recognized political polling center; writing columns for publication in the Boston Herald and local media; or interviewing live on Boston Herald Radio. You will also learn how to analyze asthetics of various forms of media, as well as the impact media has on opinion and culture. Choose a concentration in Journalism and Media Production or Media Studies, and graduate as a trained professional with the skills and talent to embark upon the communications career you've always dreamed about—with the portfolio and social media following to back it up. Or, choose to contiue your education at the graduate level in such areas as film or media studies, journalism, health communication, public relations, or marketing. 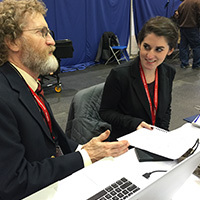 The Journalism and Media Production concentration uses professional best practices to provide authentic learning experiences that prepare students for success in the working world. Working collaboratively on a variety of projects, from numerous genres, students create media messages for print, online, and broadcast media outlets. The Media Studies concentration is designed to increase understanding of the relationship between media and culture. It focuses on the close reading of media texts, on culturally informed critiques of media content, processes and contexts, and on raising societal awareness of the growing impact of media on individuals, diverse communities and the world. Explore an array of opportunities in communications, media, and politics through hands-on learning. Connect with communication networks that reach constituents on campus, within the region, and beyond to the national arena. The "Fitz" provides you with the opportunity to work with state-of-the-art equipment and technology, while gaining hands-on experience. Produce and cablecast a variety of shows, entertainment, and news campus-wide from this student-run television station. Write, edit, and print your own piece in the Pierce Arrow, a student-run newspaper, or on The Exchange, a digital journalism platform that reports on campus, community, and global issues and events. Speakers and Lectures The speaker series is modeled on the press conferences run by Marlin Fitzwater while he was press secretary to two U.S. Presidents, and features media, government, political, civic, and business leaders discussing the leading issues of the day. Lambda Pi Eta You have the opportunity to join Franklin Pierce's chapter of the honor society of the National Communication Association if you meet national requirements for induction. Matt Berman and John Perry, 1992 graduates of the Communication program at Franklin Pierce University, have gone on to successful Hollywood careers in TV and film. In this video, they return to their alma mater to screen their newly released hit movie "The Wedding Pact" and to share their career advice and experiences with students. Communication graduates find their calling at the worldwide leader in sports. Download a Communications program sheet to view on-screen or print, or view the College at Rindge Academic Catalog for specific degree requirements and course information.